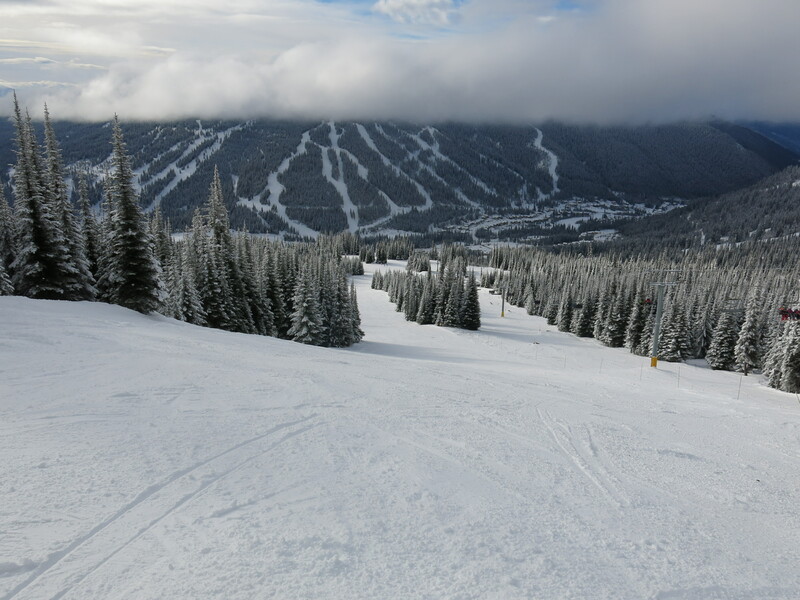 Sun Peaks is northeast of Kamloops in an area that doesn’t have any other large ski resorts. 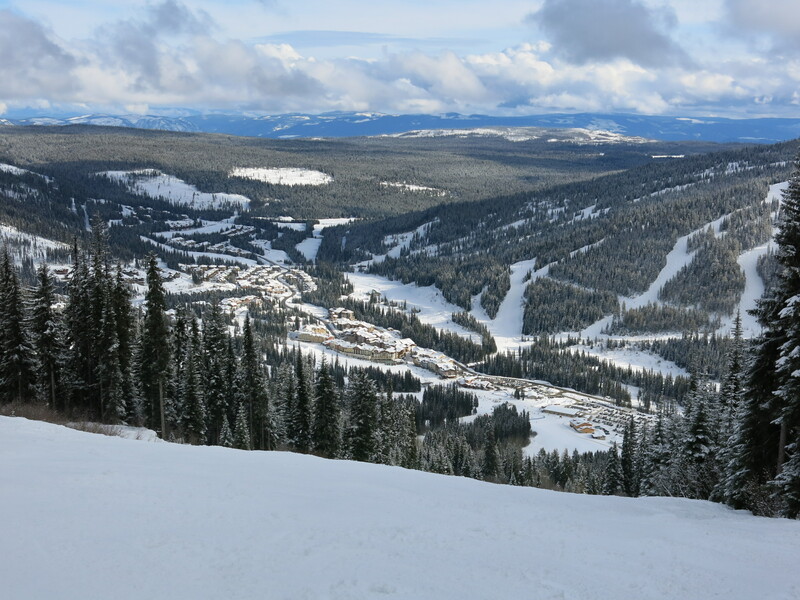 It’s the 2nd largest ski resort in Canada, with 3 distinct mountains so we decided to spend 2 days there on our 2017 Big Trip. 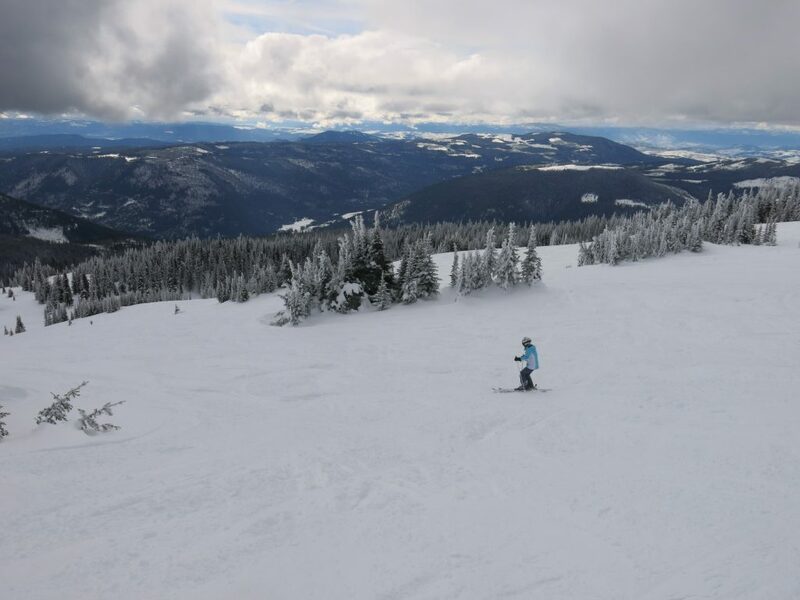 Sun Peaks was the last resort on our 2017 Big Trip through Oregon and interior BC. We had to stay in Kamloops which was pretty far away because this was “American President’s Day” which is what Canadians call it, and everything was booked by the time we figured out when we were going to be there. It’s a nice easy drive though, and we enjoyed the town of Kamloops which is fairly large and has definitely far cheaper lodging options. Kamloops is in a central location in BC and it would be a great place to live because it isn’t that cold or snowy, and it’s easy to get to some great recreation from there via freeway. We took 2 days to ski most of the mountain, but definitely didn’t get everything because this place is BIG with a lot of hidden zones that aren’t obvious to the casual tourist like us. 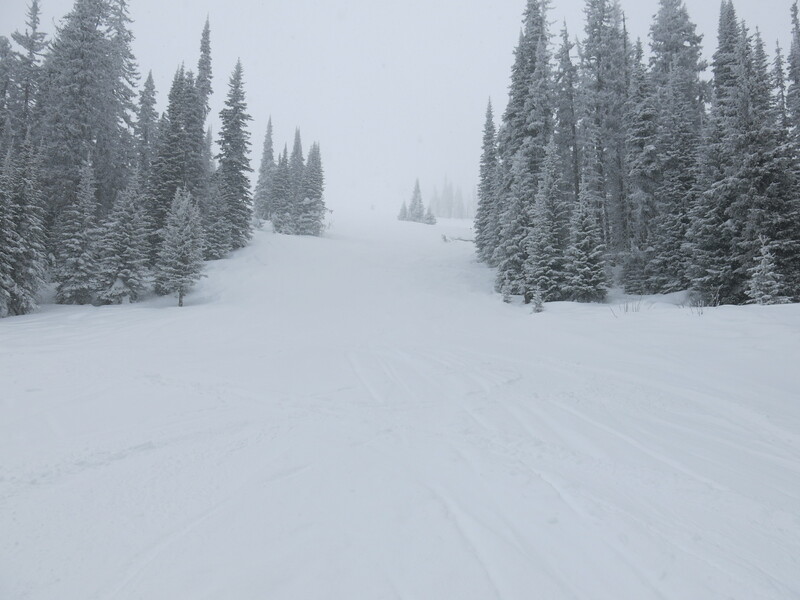 We started on the Sunburst Express which services a whole bunch of fantastic groomed blues down the front side, and some nicely steep blacks on the east side. 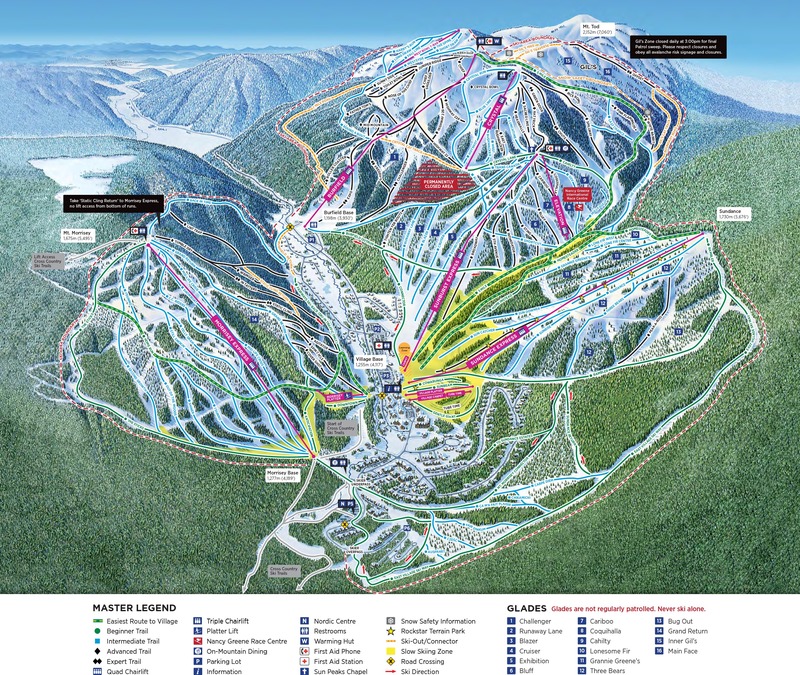 This is exactly the kind of terrain ski areas are looking to develop into steeper blue terrain which is what average skiers gravitate to. After skiing a nice variety of groomed runs on Sunburst we headed up to the top of the mountain on Crystal. This was our favorite chair, along with the upper part of the Burfield chair accessed from the midway loading station. 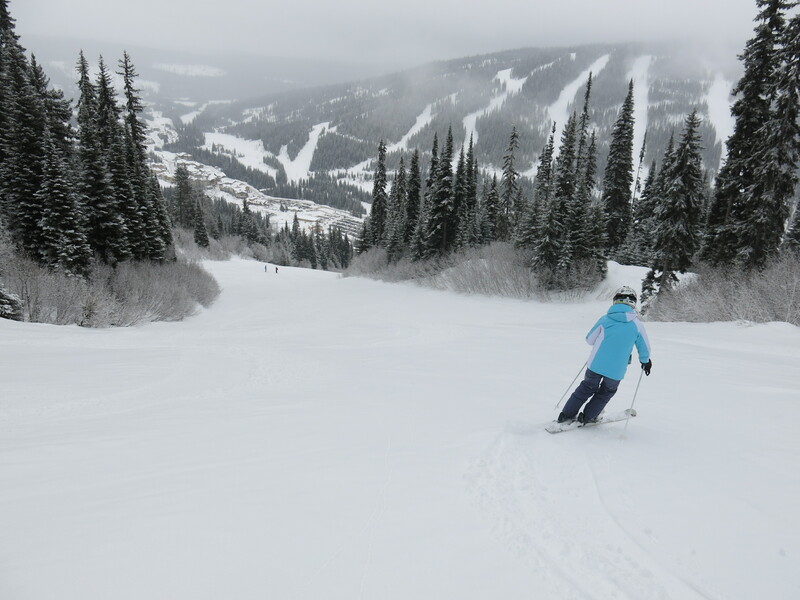 The icy snow conditions we experienced elsewhere were much improved at Sun Peaks with some fresh snow both days, and the best powder skiing we found on this trip when it was snowing hard in the afternoon of the first day in this zone. I think we skied everything on Crystal and a good selection of lines on Upper Burfield, but the trail map doesn’t really do that area justice. 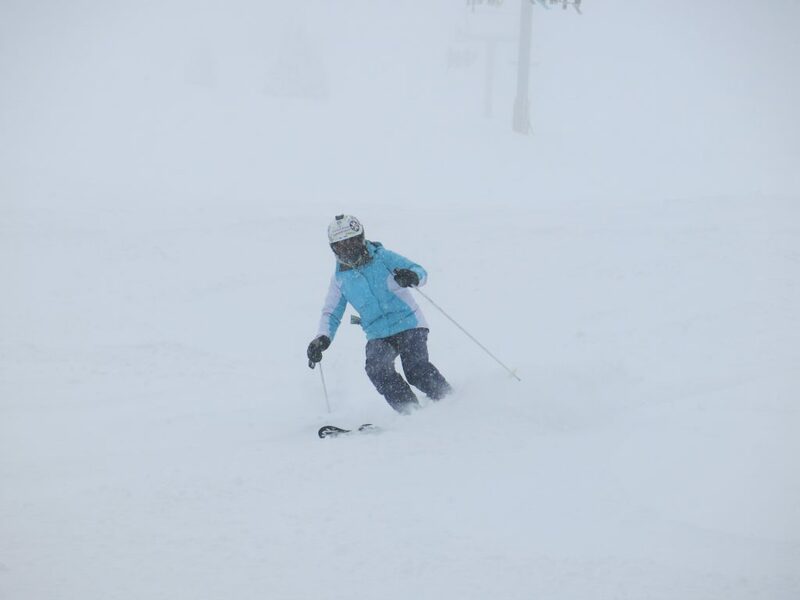 There are lots of unnamed lines from the top of Mt. Todd and in fact at one point we got a little too far off the beaten path into a challenging terrain trap that was very steep and narrow. It was also super foggy up there when it was snowing and it was hard to find our way around not knowing the area at all. The Burfield chair is probably the longest fixed-grip chair in existence anywhere today. 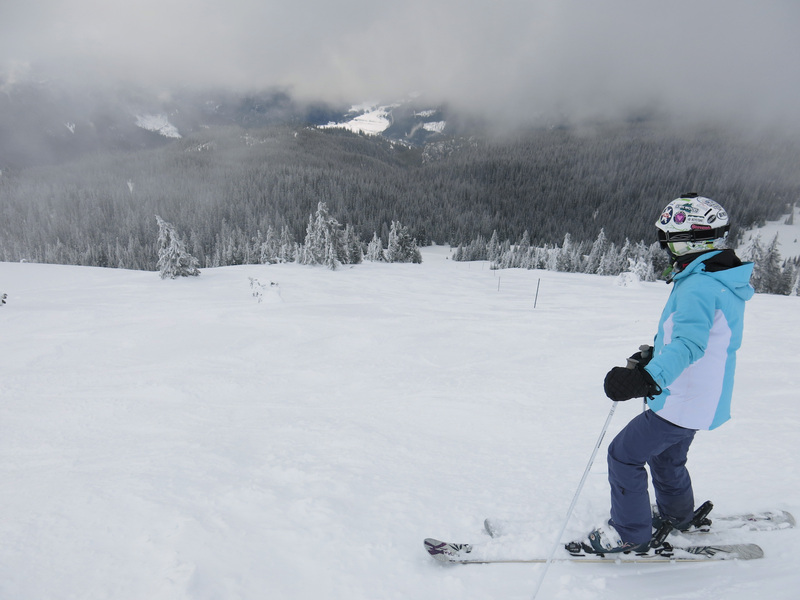 It rises an astounding 2,894 vertical from the lowest point of the resort to the highest. That is a LONG ride and it took quite a chunk out of our first day of skiing. 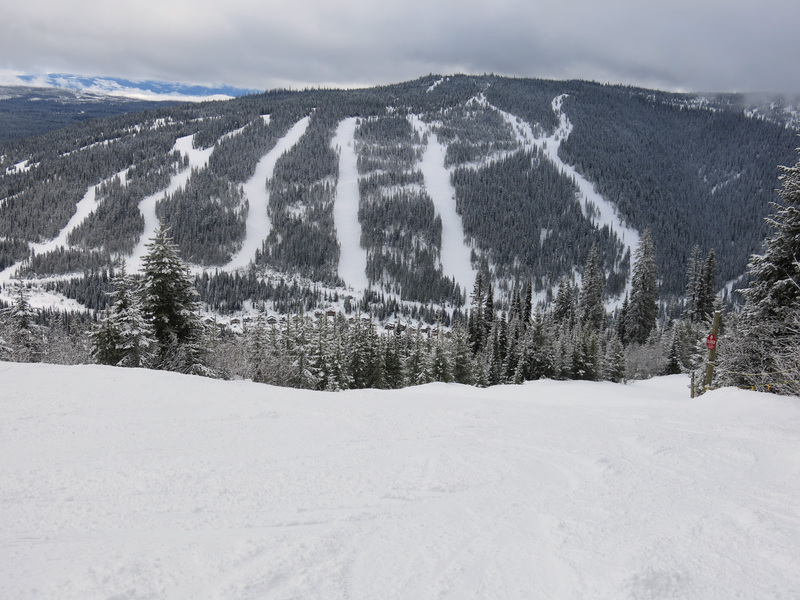 It was interesting seeing the very steep black runs from the chair that weren’t really skiable due to ice underneath the couple of inches of fresh that fell lower down on the mountain vs. the 6+ inches up high. I would imagine this terrain would be a lot like the lower front side at Taos when the snow is better and I would have loved to ski it, but it just wasn’t possible when we were there. Both days we had lunch in the village and the first day we found a cafe that we really liked. Even though the resort was super busy there seemed to be a lot of dining options that we could have chosen from, but we like the cheaper simple eats in general so that was perfect for us. The 2nd day we explored the other 2 mountains “Sundance” and “Mt. Morrisey”. Sundance is quite flat so we just sampled it and moved on, but that is a super popular area and I was glad half the skiers were on that mountain. Morrisey is a little hard to get to but has some interesting easy blues on the east face, and some very challenging black and double-black bump runs on the north face. Again the conditions down low there on the ungroomed terrain were quite firm so although it was skiable, it was a real workout. Later in the afternoon we headed back to Mt. Todd and explored some of the Gil’s zone which is short but has more of a backcountry feel to it with some great glades. 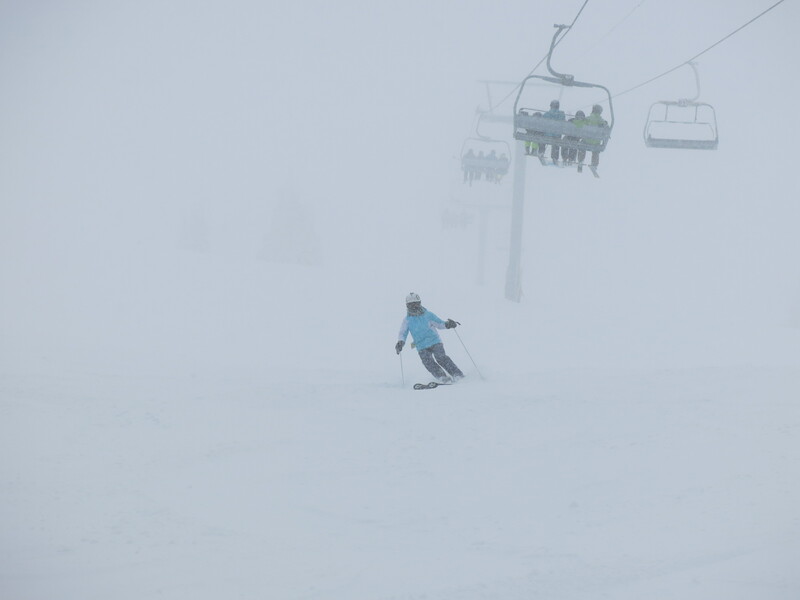 We also tried the T-Bar which is marked blue but it’s really green. We enjoyed talking with the friendly locals on the chairs each and every run where we rode with other people. People were without fail very interested and welcoming of the fact that we came up from California to ski their paradise. I don’t think we’ve ever felt as much at home skiing a place that is so far away. 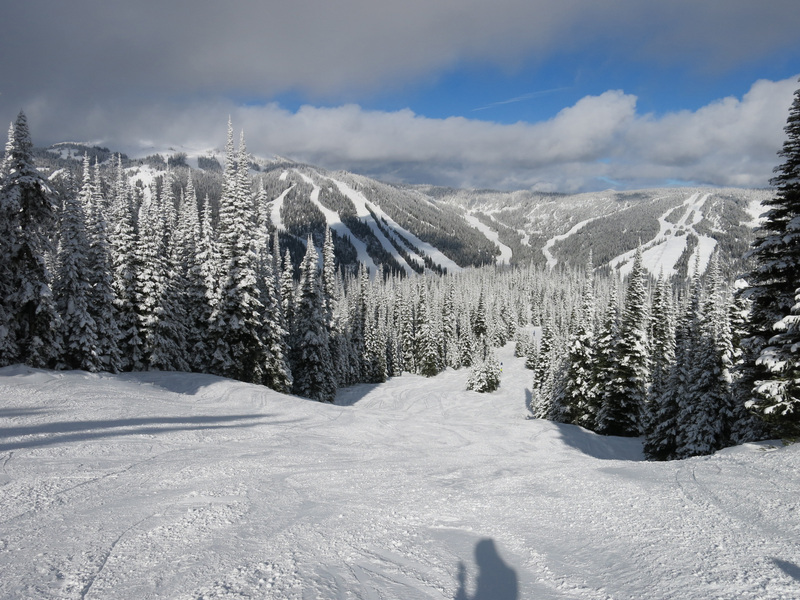 Oh yes — definitely planning to go back to Sun Peaks after the project is over and we can devote more time to repeating some of our favorite places.